Built 1919-1921 as "Teatro Cervantes" by Aranda and Reppeto for the actors and impresarios, María Guerrero and Fernando Díaz de Mendoza. Named in honour of the Spanish novelist, playwright, and poet Miguel de Cervantes Saavedra (1547-1616). Opened 5 Sep 1921 with Lope de Vega's "La dama boba". 1926 nationalized. 1947 renamed "Teatro Nacional Cervantes". Damaged by a fire on 10 Aug 1961. Subsequently rebuilt. Re-opened 1968. 1995 declared a national monument. 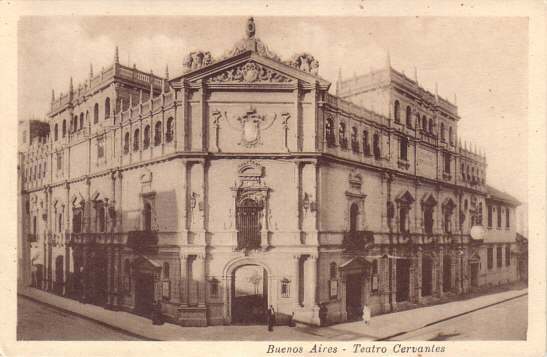 Front Text: "Buenos Aires, Teatro Cervantes"